The Sweating Sickness was a new phenomenon in later 15th and 16th century Europe, recognised by contemporaries as being distinctively different from the plague and other epidemic diseases. The illness was almost exclusively confined to England, and was soon known as the ‘English Sweat’ (sudor anglicus). Sufferers experienced great thirst, heavy sweating and a high fever, and died within about five hours if the disease proved fatal. Contemporaries observed that the Sweating Sickness particularly affected the more affluent sectors of society, with young men especially vulnerable. There were five outbreaks in England, in the summer months of 1485, 1508, 1517, 1528 and 1551. The 1517 epidemic struck King Henry VIII’s household, while that of 1528 affected the entourage of Cardinal Wolsey. Title-page of Wellcome Library EPB/4542/B, stating that the treatise was ‘written with a hasty pen’. Image credit: Elma Brenner. Although the Sweating Sickness was recurrent only in England, in 1529–30 a disease with many of the characteristics of the English Sweat affected continental northern Europe, spreading from Hamburg to Bremen and other northern German cities, then south to Alsace and Bavaria. The Library holds a copy of a short treatise printed in 1529 in Strasbourg, the chief city of Alsace, which provided much-needed explanations and advice during this continental outbreak. This is one of around 50 different pamphlets on the Sweating Sickness printed in Germany in 1529–30, most of which now survive in very few copies. The Strasbourg pamphlet is held in only two other UK libraries. The rapid proliferation of printed literature on the English Sweat in Germany contrasts markedly with the situation in England, where no significant work on the disease was published until John Caius’s A Boke, or Counseill Against the Disease Commonly called the Sweate, or Sweatyng Sicknesse in 1552. Following the Reformation, print had become a well-established means of quickly disseminating information in Germany. 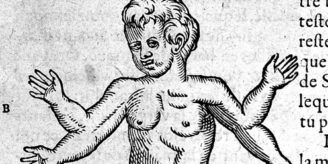 Yet the multiplication of pamphlets in 1529–30 also reflects considerable alarm at the sudden appearance of a new, deadly disease that had not previously affected the continent. The Strasbourg pamphlet was jointly authored by two physicians, Johannes Nidepontanus (Jean Neidbruck) and Lorenz Fries (c. 1490–1531). While little is known about Nidepontanus, Fries was a municipal physician of Strasbourg and a prolific writer, who wrote a treatise on the French Disease, another ‘new’ disease of the period, among other subjects. The pamphlet opens with an address to the bishop of Strasbourg, Wilhelm von Honstein, and ends with a prayer to God, reflecting contemporary beliefs about the role of divine intervention in inflicting and defeating pestilential disease. The text defines the English Sweat and discusses its aetiology, and then differentiates it from the plague, addressing why this new disease, unlike the plague, is not manifested in swellings on the body. The authors refer to longstanding medical authorities, such as Galen, Avicenna and Haly Abbas, in providing their explanations. The second part of the text outlines a regimen of health that people should follow to protect themselves against the Sweating Sickness, paying particular attention to diet. It states, for instance, that milk, cheese and all other milk products should be avoided. The final sections address treatment for those who have succumbed to the disease, describing which medicines should be administered and how the sick should be cared for. 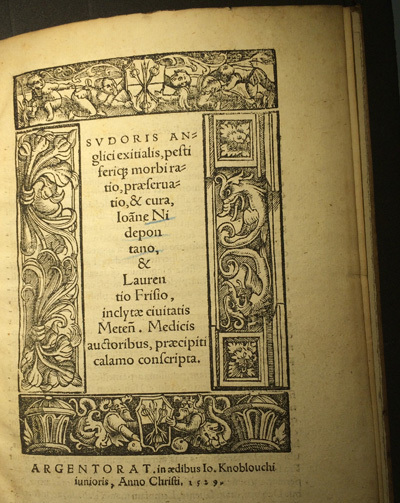 Like many other German pamphlets published in 1529–30, Nidepontanus and Fries’s tract was rapidly produced, as evidenced by the accidental mis-numbering of its sequence of chapter headings. These physicians were responding on the ground to a newly arrived, much feared epidemic, and providing explanations and advice for which there was high demand. Yet although they were dealing with a new disease, their narrative was firmly rooted in ancient and medieval medical learning, and they followed the conventional model of the regimen of health. These features suggest that they envisaged their audience as consisting of not only the vulnerable people of Strasbourg, but also their fellow learned physicians, many of whom were simultaneously composing treatises on the English Sweat. 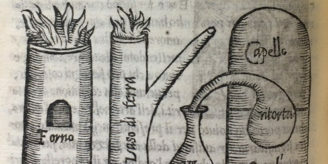 Author: Dr Elma Brenner is Specialist, Medieval and Early Modern Medicine at the Wellcome Library.